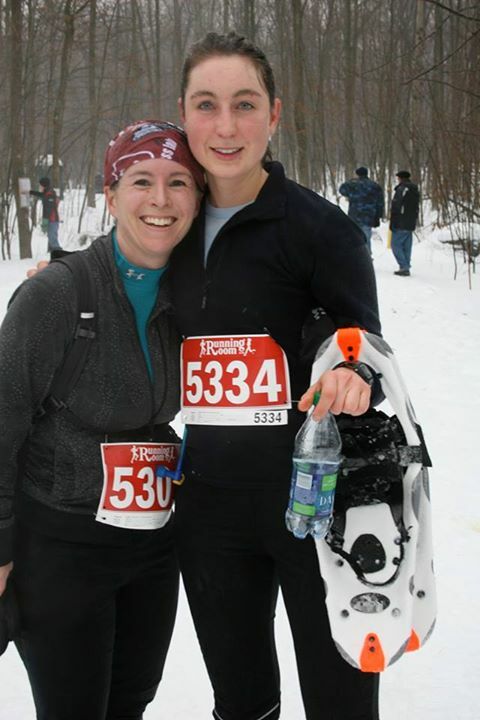 I was not able to attend the Summerstown Snowshoe Race this past Saturday, but thanks to my friend Amanda we have a race and trip report from this rather icy day. I was asked to write a race report as Vicki was not able to attend the Summerstown race. Since the past year has been a year of 1sts, I thought.. why not! As it has been discussed, some of the more technical trail was out on the road in getting there. My friends Maude, Renee and I decided that we would try out the 417 and if things got too messy we would turn back. Little did I know that not only did we make the race (just on time, I’m getting to that part of the story), but we had a lot of fun driving down that we passed the exit off the highway. It probably didn’t help that I suggested to mute the damn GPS as it was interrupting our conversations. Thankfully, Renee noticed that something was off and we headed back in the correct direction. Just as we arrived to the race site, the the clock on my car showed 9:54 and this SOB of a salt truck decided to stop in front of us, and block the car from entering in the driveway! Thankfully with my honking, and one of the volunteers, the freakin’ truck moved. Changing shoes, racing to the start line, we were welcomed with a 10 minute grace period as a few others were running late also. I think we all agreed that our warm-up was the heartbeats of getting ready so fast! The organizers and volunteers kindly checked us in quickly and we soon settled in nicely and got ready for the race. The race was fun, challenging and other than the rain at the end, it was beautiful weather. There were many volunteers and people cheering at various parts of the race course. There was some nice rolling hills and some nice hill climbs that reminded me I have some work to do, and there was never a boring moment on the course. Maude and I were running together until she broke free about halfway in the race and to which I was trying to chase down a fellow competitor. I felt compelled to try and catch up and catch her, but sadly she created a bit more separation which made that difficult. There was even a kind word from the volunteers letting us know that were weren’t far from the finish line. I think everyone had a great attitude for the whole event. If you have a chance to participate in this event, I would highly take the drive down and join in. The terrain is different than Gatineau Park. More narrow, hard packed and had some technical challenges. It was also a lot of fun to meet new people and share the fondness in being outdoors. The post brunch with Dave and Lise goes to show why some of us show up to these races. A good workout with great company. You can’t beat that. Thanks Amanda for this great race report. From everyone I’ve heard from it sounds like it was an epic day in the car and on the snowshoes. Here’s a link to some photos and the report from Spafford Health and Adventure. Congrats to everyone who participated. Thanks for including me in your blog. It was fun to write this. Amanda, thanks for taking the time to write the race and trip report! I always like to have other people contribute. I hope your post has inspired others to take up a new challenge.